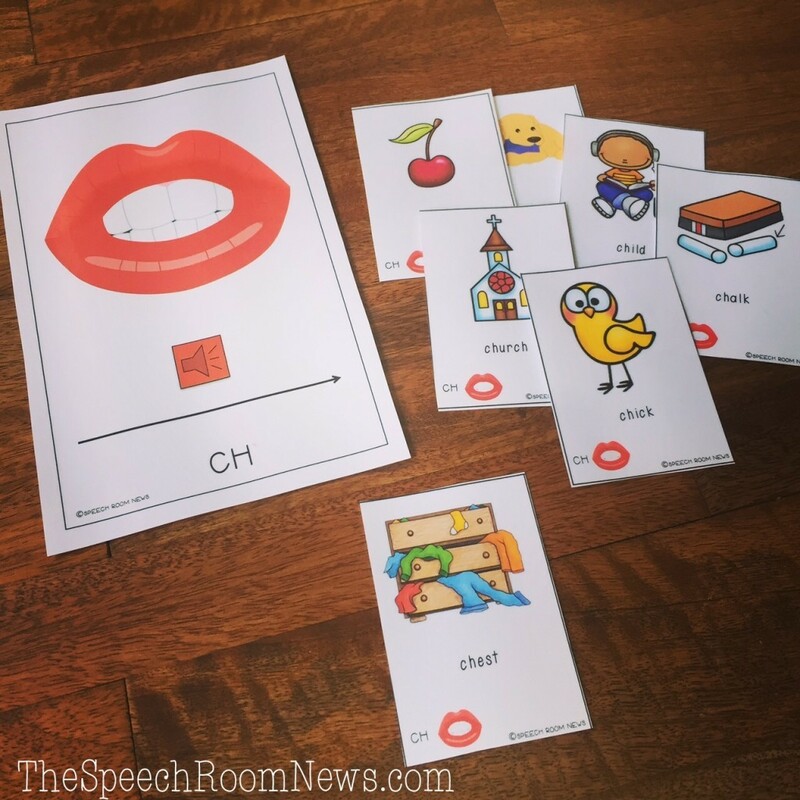 Articulation therapy focuses on first correcting the speech errors and then changing the motor plan to correctly produce those sounds in conversational speech. We know a high number of trials is required, but that can be difficult to obtain, especially in group therapy. 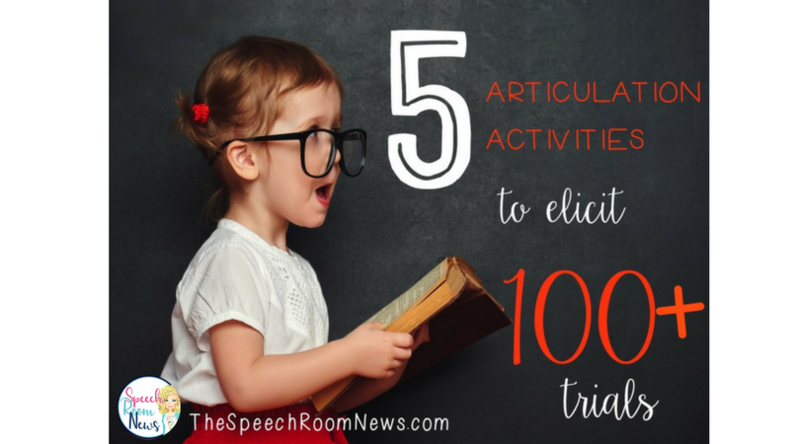 I’ve listed 5 ways to elicit 100 trials while keeping kids engaged. Each of these are ideas straight from my speech room! ONE: Dollar Challenge. Three years ago I wrote about the Dollar Challenge I did with my students. They used regular artic cards to elicit 100 trials and earn a dollar for our wall. Now that I am going to the preschool classrooms, I needed a way to revise the program to elicit the same number of trials but in an easy to use format with the words already included. After we say 100 target words together in speech, I can send the paperwork home so parents can easily view. To play, the students practice the 10 artic words at the bottom of the page until they have completed 100 trials. They color in the pennies as they go. Once they reach 100 pennies they color in the dollar! 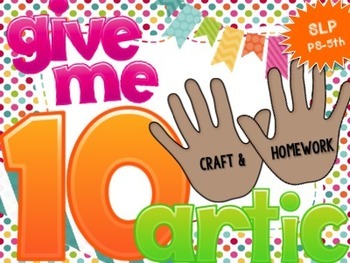 You can find the Dollar Challenge activity in my TpT Shop. 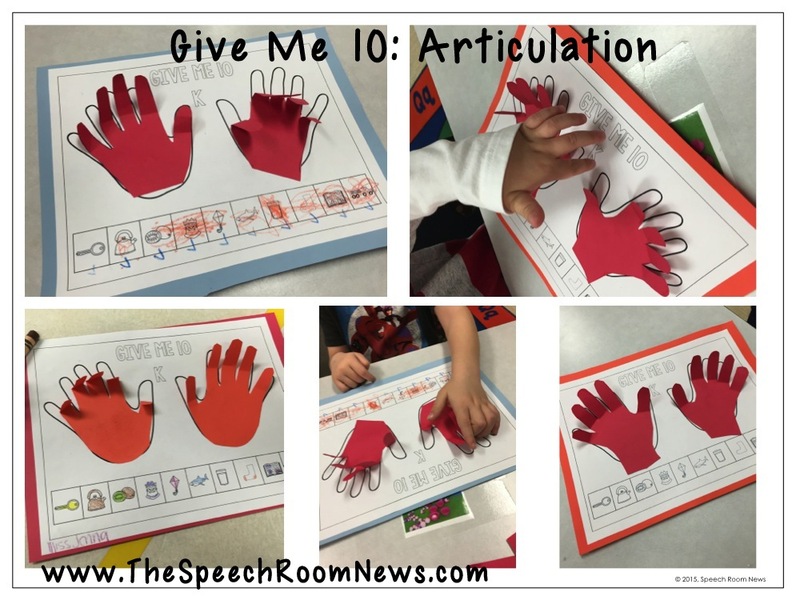 “Give Me 10” is developed to help students practice articulation targets multiple times while counting on 10 fingers. It gives children a visual feedback support by showing the number of trials they have completed. This set is meant to be very flexible to meet the needs of your caseload and includes both long and short crafts as well as follow-up homework sheets. The target of these activities is to elicit 100 trials. Each word practiced 10 times each will elicit these trials. 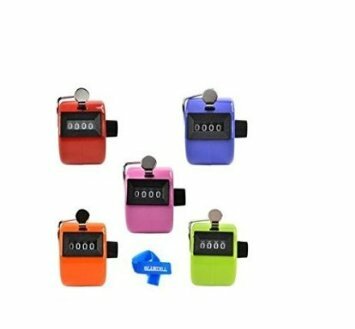 You can grab the tally counters really easily on Amazon. They pair easily with my articulation cards. They include 65 pages of articulation cards. It includes 516 articulation cards. Laminate all cards. Use the visual cues in the bottom corner to increase student independence. It will allow your student to visualize the mouth position for each sound. The following sounds are included with 8 cards in the initial, medial, and final positions for a total of 24 cards for each sound. P, B, M, N, T, D, S, Z, F, V, L, K, G, J, SH, CH, TH. The following sounds are included with 8 cards for each sounds: R, ER, AIR, AR, OR, EAR, IRE. The following blends are included in the initial position: 28 S-Blend cards and 24 L-Blend cards. 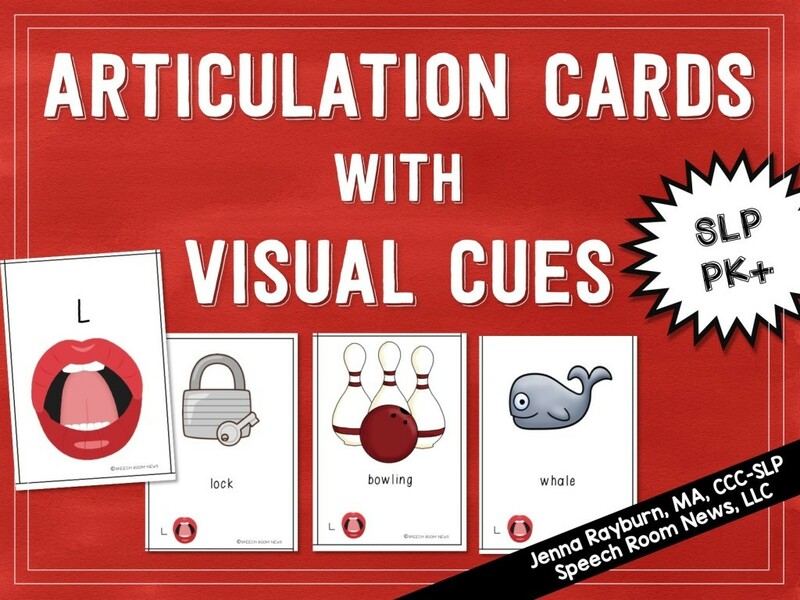 The blend cards have both consonant sound visual cues. Have student use the tally counters to track their correct productions. One they reach 100 trials, time them during the second 100! Can they beat their time? FOUR:: Sound Towers are something I posted about back in 2011. Grab 100 Dixie Cups. Have your student write artic words on the bottom of the tower. Use them to stack into towers. Say each word as you stack it. Make several towers until you finish all 100! includes several sounds and focuses on saying as many sounds as possible in one breath. 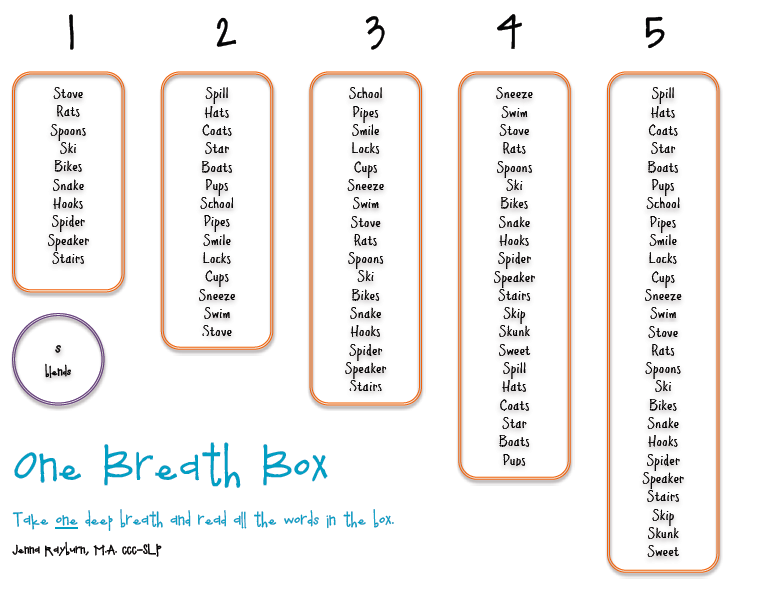 This engaging activity gets kids in a rush to complete their speech words! I’d love to hear any other ideas you use for completing a high number of trials each session. So many cute and fun ideas! You must take after your SLPMomma, Ha-Ha! Thank you so much for this amazing resource. I will definitely be using it for my younger artic kids. 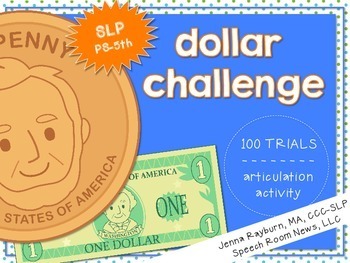 I am excited to use the Dollar Challenge with my students this year. I’ve been looking for a way to increase the number of trials in a session and I think this will motivate even my 6th graders!! Oh, no! I will check it as soon as I get home and then you can redownload the file. Do you do this in groups? How big are the groups? I can easily get at least 100 responses during my 5 minute days. It’s strictly “kill & drill” for 5 minutes without any kind of activity. I have done it in group up to 4 kids. It kinda of becomes a behavior management activity because they get on each other about talking and goofing off because they need to be quiet to let everyone get all their work done! That was with a group of 2nd graders. 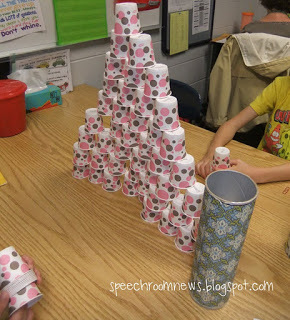 I love the tower cups activity. I use dominoes as an activity to achieve a high number of trials. The kids create designs and they want to do it many times. Oh what a great idea! I haven’t tried that before. A great post with so many great ideas all in one place! 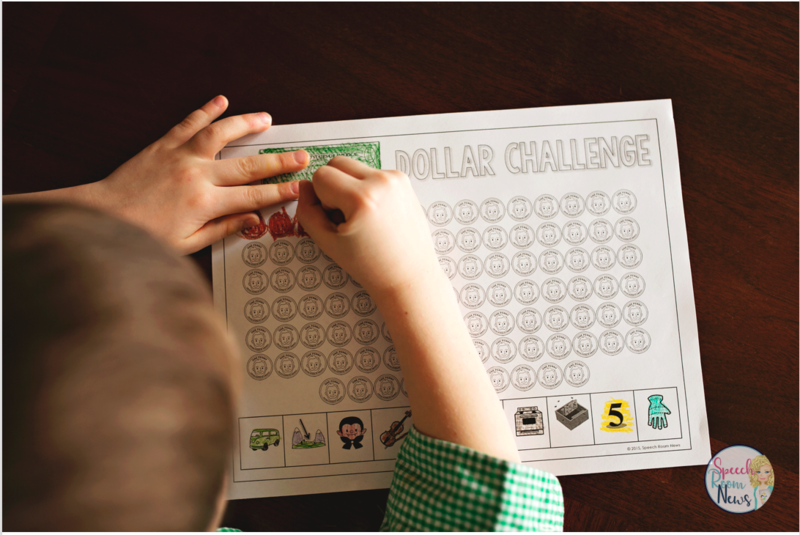 Do you have the download for the adapted dollar challenge for pre-K where you use pennies instead? Such fun ideas! I must try the cup challenge next! Super fun for individual or group sessions! I’ve also done a similar penny game where they push 10 pennies 10 times as they say a target word. I also use an abacus! I put pictures with targeted sounds on one side and each time my students practice a word they can slide a bead over! If they do all ten words they get 100 trials!! !